Finding Nemo starts off with a bang. Marlin the clown fish (Albert Brooks) and his sweetheart are proud parents-to-be, when a shark strikes, leaving him alone except for one misplaced egg that survived the attack. Naturally, the single father is overprotective of his only son Nemo (Alexander Gould), who sports one fin shorter than the other. Constantly warned to not swim into open waters, Nemo defies his father and gets scooped up in a scuba diver’s net and is carted off to Sydney, Australia. It then becomes Marlin’s mission in life to find his son, who has become the latest addition to the aquarium in a dentist’s office. Writer/director Andrew Stanton, who collaborated on Pixar’s A Bug’s Life and Monsters, Inc., has the Pixar formula down pat: dazzling digital animation, smart stories peppered with smart humor, and a bit of edginess for older audiences. In this case, the edginess comes from an overall tone that is darker than Pixar’s previous efforts. 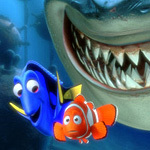 The film also takes full advantage of its voice talent, particularly Willem Dafoe (Spider-Man) as Gill, one of Nemo’s fish tank compatriots, and Ellen DeGeneres (TV’s Ellen) as Dory, a memory-challenged fish who befriends Marlin. While Dory’s quirky personality does start to grate on the nerves after a while, DeGeneres fills the role of the affable-but-annoying buddy quite well. The handsome holographic blue slipcase and $15 price tag for 2 DVDs are alluring bait. The eye-candy of the movie seems to have inspired the marketing department. Inside are two full versions of the film (widescreen and full-frame), and an assortment of extra features that run from the mediocre to the entertaining. Disc 2 features more of the “for kids” features. Almost none of these are informational, and none of them are as funny as they try to be. For every fact about real fish or computer animation there’s an overtold joke that falls flat. Disc 1 has slightly better fare. The visual commentary features behind-the-scenes factoids on topics such as virtual lighting, simulation programs, and how the story came together. It also features the documentary Making Nemo. On both discs are virtual aquariums. On any menu screen, at the touch of a button, you can remove the menu text and leave your TV in screen saver mode, as it were, with a bubbling aquarium of cartoon fish. Overall, the DVD’s extra features are more “clever” than interesting, so I don’t recommend buying it for the extras. The best part of the DVD is simply the movie itself. The 2-disc set comes with two versions of the film: widescreen and full-frame. According to the slipcase, the full-frame version was “specially reframed for standard televisions,” and a quick intro on Disc 2 backs up the claim. There is actually more visual information on the full-frame version than on the widescreen version. In other words, the widescreen movie is cropped from the full-frame version. In the case of Finding Nemo, a movie where you want to be submersed in the visuals, it’s better to have as big a picture as possible. I have long been a wide-screen purist snob, but I’ve come around to full-frame versions of some movies. The bigger picture really is more engaging on my square TV. So long as the filmmaker(s) endorse the full-frame version, and so long as brilliant cinematography isn’t the movie’s raison d’etre, I’m inclined to give the full-frame a try. The Finding Nemo DVD is digitally recorded, mastered, and presented, so the picture quality is excellent. The THX-certified, Dolby Digital surround sound is superb as well. Finding Nemo is an enjoyable movie, and well worth a rental if you missed it at theaters. Hard-core fans will want to buy the DVD, not so much for the “clever” extra features, but for the crisp, vivid, presentation of the movie, regardless of the shape of your TV.